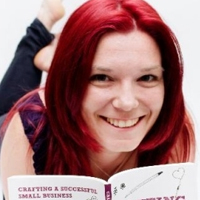 This is a guest blog by Joanne Dewberry, Founder of Charlie Moos party bags, toys and accessories, author of ‘Crafting a Small Business‘ and Sage Business Expert. If you ever get the chance to see, hear or meet someone who you aspire to in business do it! Mumsnet Workfest 2015 not only provided mums looking to go back to work or start a small business with invaluable advice but it also put the fire in their bellies. I loved listening to how Mumsnet finally started making money after 6 years in business and how many times Michelle Mone hit rock bottom but found a way back to the top. 1. Your new found skills you acquire as a mum – time management, budgeting and sewing or volunteer work you may have undertaken without realising from helping out the PTA will have a valid place upon your CV. 2. Thinking about starting up a business? Stop thinking and start starting! You can do it! Make yourself accountable, start writing what you want to achieve and how you are going to get there. The stories from Annabel Karmel and Michelle Mone are so inspiring as these women didn’t give up! Both had young families but both believed in their products and persevered until they are what you see today. I’m sure there was many a time they could have hung up their cookbooks and bras but they didn’t! 3. Group your followers. social media can be overwhelming and you can sometimes be reading the same things on different platforms so group everyone accordingly. On Google+ put everyone in Circles, on LinkedIn tag everyone’s profile with a keyword, and on Twitter put everyone in Lists. This way you can target the content you push out and the content you read, so if I only want to see ‘craft business’ today I can easily find them on any platform! 5. PR isn’t all about social media! With limited budgets, small businesses owners can get sucked into thinking social media is the only way to market businesses. Michelle Mone told the story of how she paid actors to dress as plastic surgeons and picketed outside the launch of Ultimo at Selfridges. The PR was immense and Selfridges sold out in hours! Ultimo is always well know for signing up famous celebrities to model their bras this endorsement. Celebrities are much easier to get a hold of on Twitter/Instagram these days. Be bold be brave ask them if you can send them a product. Of course another great perk of the day is being able to network with like minded individuals face to face. Sharing experiences, advice and talking through ideas is always a winner in my eyes.